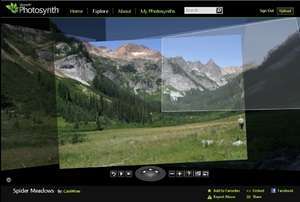 Photosynth is a powerful set of tools for capturing and viewing the world in 3D. You can share your creations with your friends on Facebook, publish them to Bing, or embed them in your own blog or Web site. Shoot a panorama when you can capture everything from a single location with a single zoom level. Great for giving a sense of what it feels like to be in one particular place. Version 3.0114.0807.1507 is a freeware program which does not have restrictions and it's free so it doesn't cost anything. For security reasons, you should also check out the Photosynth download at LO4D.com which includes virus and malware tests. Additional screenshots of this application download may be available, too. Photosynth download been highly rated by our users.